We have been trying to get all of our boat projects done before we leave to go south November 1. Most of them require work to be done outside so the weather has been a factor and we are behind schedule (which always seems to be the case). I finally finished the water maker installation last week…yay! We decided to put one in so that we can been self sufficient with fresh water, especially in the Bahamas and other remote areas where water is not available. The tank on our boat holds 170 gallons of fresh water, which we can make last a couple of months if we are really frugal, but for a few thousand dollars we can make our own and not be afraid to take showers every day! Our friends Mark and Jan on the other Island Bound have a water maker, and they graciously made water for us as we traveled last cruising season, and we got to see how much more comfortable life can be when you have that capability. We will still be very diligent about conserving fresh water, but can relax the conservation efforts to a more comfortable level. As always, we try to post information about these types of projects to help other cruisers with their projects. I did a lot of research about what type of system to put in. There are systems that run off of the battery bank, and systems that run off of AC current which require a generator. There are pluses and minuses to each, just like everything, and you have to pick something based on your specific situation. We opted to go with an AC current solution. The main reason is that it will make 25 gallons per hour of fresh water, which is 2 to 3 times the GPH rating of the 12 volt systems. It can run off of our Honda generator very efficiently with no impact to our battery bank. There are also portable systems (costing well over $5k) and permanently installed systems. As you will see, I opted to design one that is a hybrid. By removing 8 screws, I can remove the system from the boat. 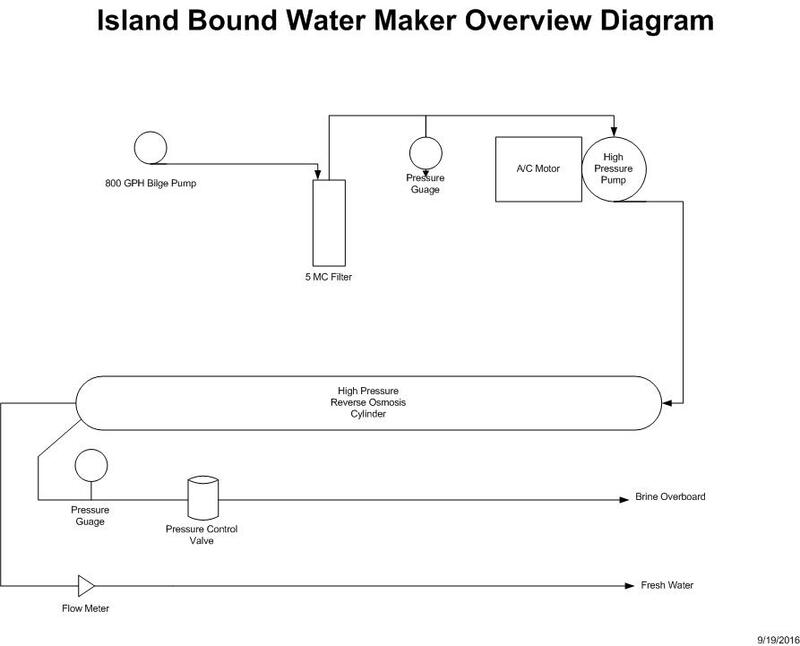 Also, the permanent systems use plumbing that is connected to thru hulls in the boat, which feed sea water and dump brine (waste) water, and are plumbed to dump fresh water into the tank below decks. I set ours up to pull sea water from a pump thrown overboard at the back of the boat, dump brine near the same place, and add fresh water to the tank through the deck fill hose. 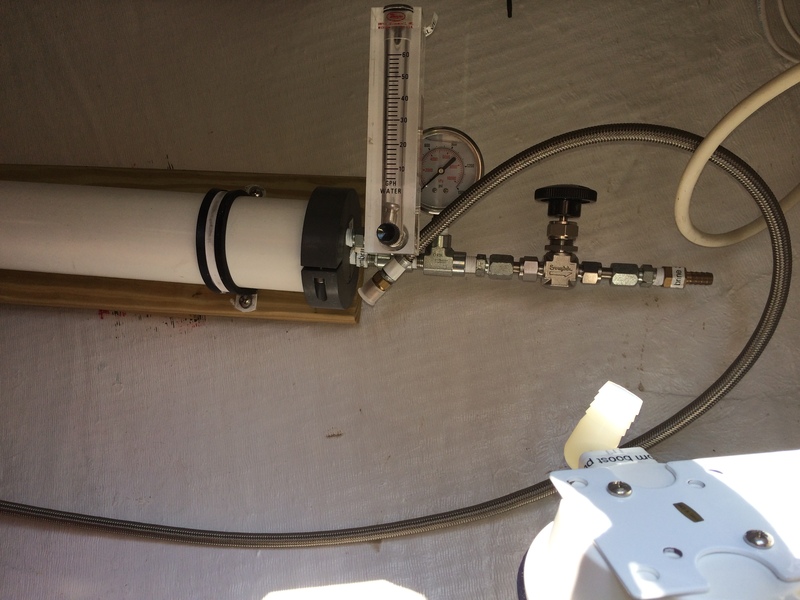 This allowed us to keep the system simple, as the permanent install requires several additional valves and hoses to sample fresh water and inject pickling solution (pickling is the process of preserving the reverse osmosis membrane when it will not be in use for several months). 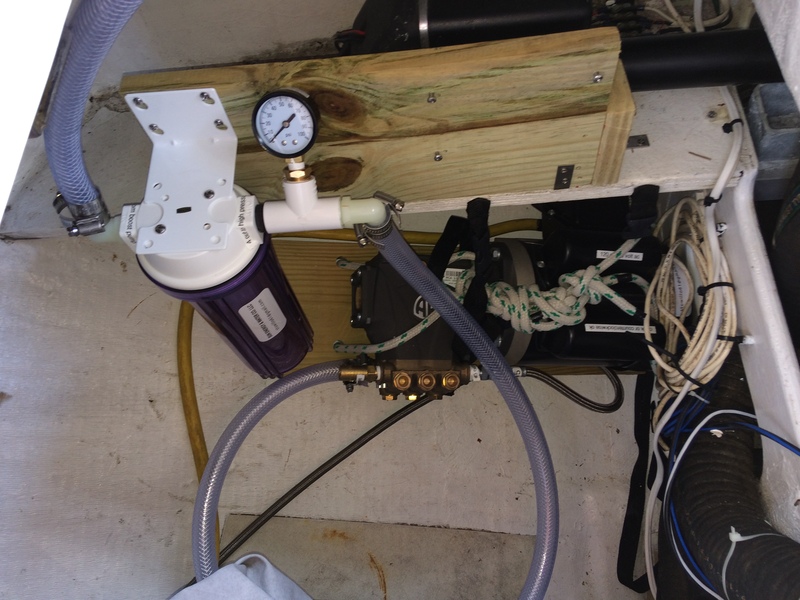 With this system, water can be sampled from the same hose that is used to fill the fresh water tank, and the membrane can be pickled from the same bilge pump that is thrown overboard to feed sea water to the system. No need for thru hulls, and no need for multiple inputs and outputs. The components are housed in our cockpit locker and the system can be operated by opening the lid and pulling out 3 hoses. I bought a kit on Ebay that included most of the components and then supplemented with separate purchases for things I changed in the design. I installed the high pressure cylinder along the hull on the inside of the cockpit locker, well out of the way of stored items (FYI..this isn’t the finished installation). The first picture shows the end of the cylinder that has the flow meter and pressure control valve. It is very easy to get to and monitor. Along the back of the locker is the high pressure pump, motor and pre-filter. The hoses neatly coil up and store behind the filter when they are not in use. The high pressure pump can run in the locker or can be lifted out to run in the cockpit. I used an old shore power chord to wire the high pressure pump motor so that I could plug the chord into the shore power receptacle of the Honda generator (model EU2000i companion). 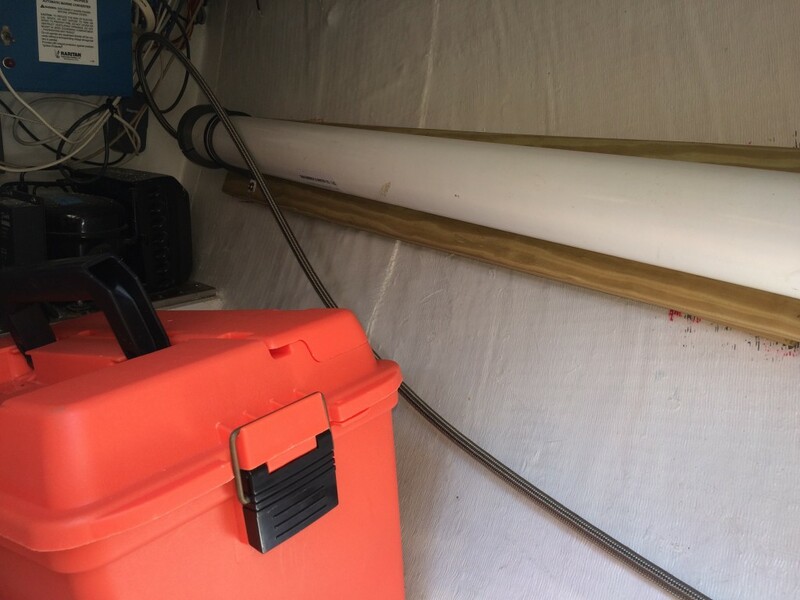 The bilge pump that feeds the sea water is wired to an AC to DC power converter that plugs into the 110 volt receptacle of the Honda generator. To use the system, you essentially deploy the hoses, start the generator, plug in the power chords, allow the system to run for a few minutes, crank up the pressure, fill your fresh water tank, and then flush the system with 4 gallons of fresh water. I haven’t tallied up the total cost yet, but I think it will come in around $2,500; which is pretty good for a water maker. This entry was posted in Equipment Review, Water Maker on September 19, 2016 by bwehmer. WOW, that is a great system and making 25 gph is crazy big time! Lucky you to have a buddy show you how to build one. I am going the other way with a 12 volt system and it will make 8 gph using 10 amps DC. So I hope to be able to run it mid day off solar or wind. We do not have a generator. Our little 35 is too small. Thanks Hayden! I’ll let you know how it works in real use when we get south. Good luck with your installation…but knowing you…it will be first class!! Great idea Bill. We’ll be waiting for your review.